CENSORED IN ARGENTINA. Watch the entire video here! 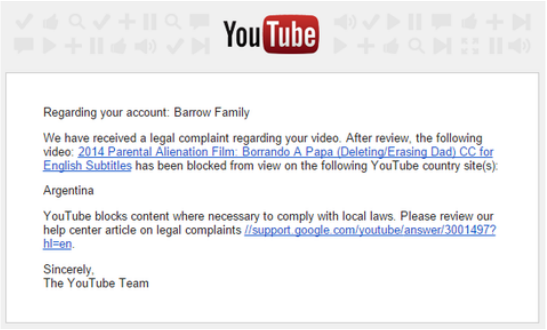 ON May 18, 2015 I received a Notification from YOUTUBE stating that they have received a legal complaint regarding one of the videos on my Barrow Family channel. The Video has since been blocked in Argentina, the country where the documentary was made. This extraordinary documentary has received backlash for revealing the common practice of prolonging child custody cases for maximizing profit and with the purpose of removing fathers from the lives of their children. "Many of the people asking for censorship were interviewed for the film, where they admit, on camera, that they do everything possible to prevent fathers from seeing their children." Kids sent to Mandy's Place not Juvenile detention facility. Google it.